The Documented Life Project challenge for last week was use a map in your journal. It took me a while to come up with something different. 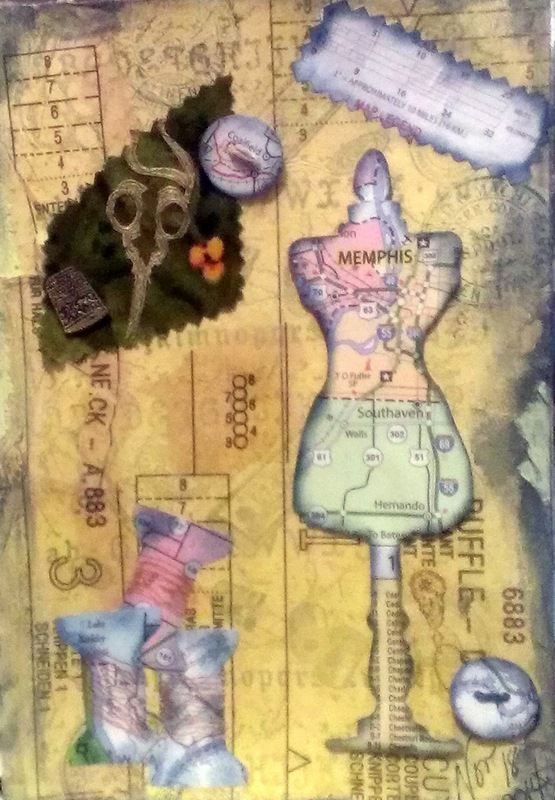 I cut my map using the Tim Holtz Dress Form Die. Memphis is my hometown so I thought it was appropriate to use that part of the map for the dress form. I love the buttons and spools that are part of that die so I added those to my page. The background is an actual pattern from a children's pattern. The scissors and thimble are stamped images from The Angel Company that I embossed and cut out. I used blue craft paint around the edge to give everything a distressed look. Thanks for stopping by and checking out my blog!! Boo, this is so clever! Not only that you have made a gorgeous journal page from the sewing items. Beautiful work. Love the page ~ and your use of sewing images with the map ... for surely these sewing notions and supplies map us to a finished piece! I appreciate you visiting my blog. Fabulous page! I really love it.